I need to thin out my collection of slabs that I have cut and polished for myself, most are agate, jasper, petrified wood, obsidian, and miscelleneous materials from Oregon, Washington, and Idaho. These are "as-is"; none of the photos are enhanced - indeed, the photos don't do these proper justice. They are well polished and have no visible scratches. Many of these are rare types that you simply aren't going to find for sale anywhere else. Slabs are noted, otherwise these are rough pieces with one side cut and polished. All pieces will be sent Parcel Post mail or flat rate priority mail ($8.00 - $14.00, depending on weight), whichever is less unless you specify the shipping method. 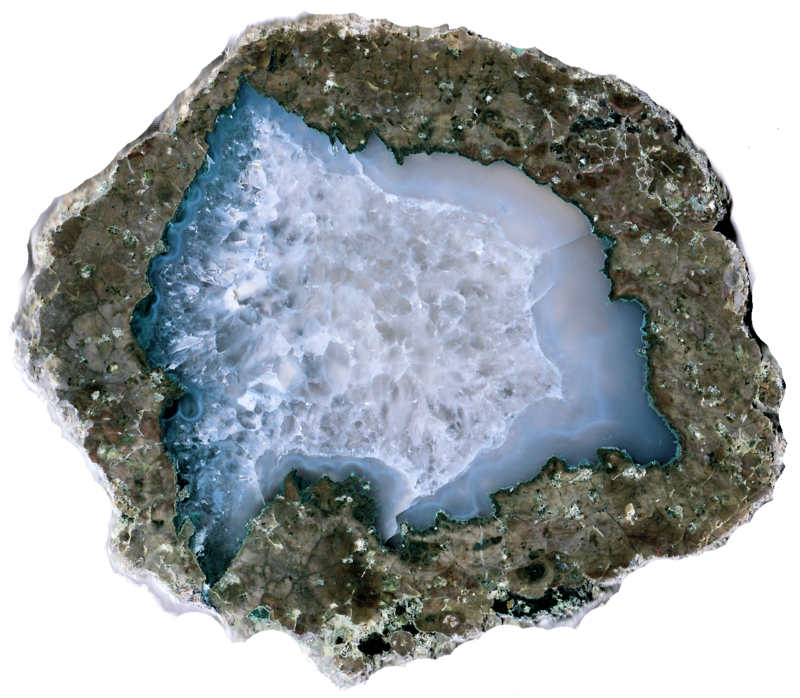 Click on the cart next to the price to purchase a rock slab via Paypal. If you don't want to use Paypal, email me at the address at the bottom of the page. All of your questions are answered there as well. For those of you who are looking for something specific in my for sale pages, such as when I list refurbished equipment, I might have a solution for you. 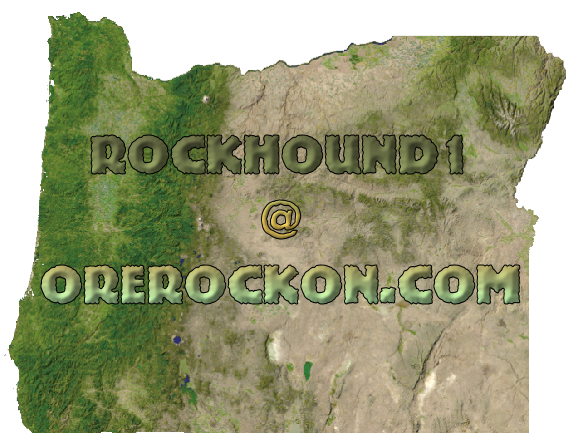 You may want to try this: https://www.changedetection.com, I think all you do is sign up and enter the address of the page, for example if you are looking for equipment enter http://orerockon.com/equipment_for_sale.html, and they should send you an email when I add something. BUT, it probably will send you a notice when I change one letter of one sentence on the page, so you might get annoyed by it at some point. It's a great way to track when I list new polished items, since I typically don't change anything until something sells and/or I add items, and equipment, which I never change unless I add new pieces or change the status to "sold" as they sell. Type " about:config" in the website address box. This should load the Firefox config settings in the window for editing. You may see a warning message stating, "This might void your warranty! ", click on it to load the settings. Then find the "browser.cache.check_doc_frequency" key and change it to "1". All slabs will be sent Parcel Post mail or flat rate priority mail ($8.00 - $14.00, depending on weight), whichever is less unless you specify the shipping method. I wil bill shipping charges later through Paypal. 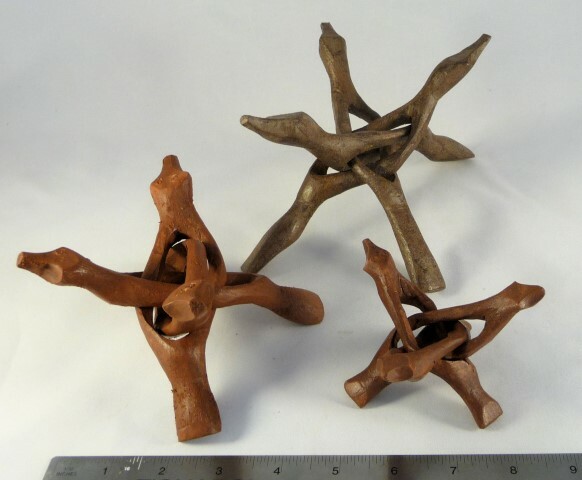 Optional: Purchase display stands for your specimens! All sizes are the longest dimension in inches. Click on the number or the pic to see the large photo. Slab 01 "Turritella agate", WY 4" piece, these are neither Turritella nor agate. 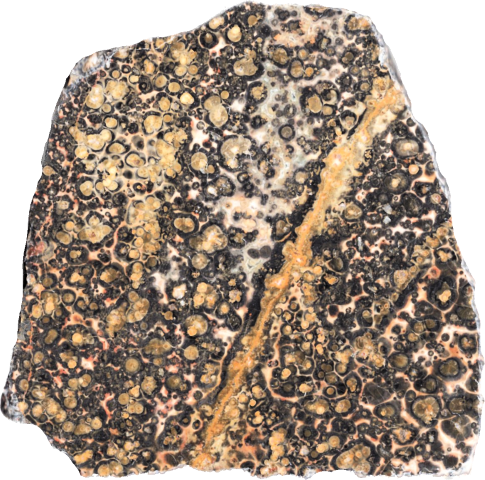 They're 55 million years old fossilized snails, but not the species Turritella. They're in jasper, not agate. Go figure. Still pretty and very unique. Slab 02 Lily Pad Too jasper, OR 4 3/4" piece, I discovered this, it is a close cousin to Lily Pad Jasper. 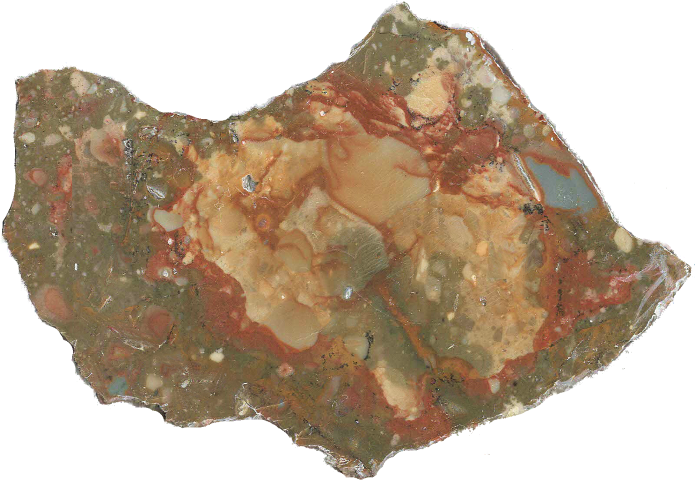 Slab 03 Lily Pad jasper, OR 3 1/2" piece, not to be confused with Lily Pad Too :) 1 Cent WITH $25 PURCHASE. Please order only one 1 cent piece per order. Slab 05 Blue Mountain picture jasper, OR 4 1/4" piece, 3 beautiful orbs in a slate blue sky. This one speaks for itself. Slab 06 Maury Mountain Agate, OR 4 1//2" piece, dark red moss. 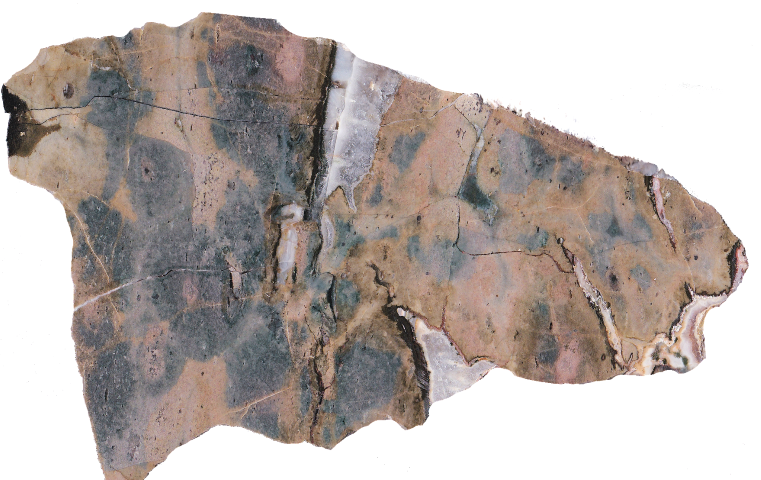 Slab 07 Willow Creek picture jasper, ID 4 1/4" piece, very nice tan and cream patterns. 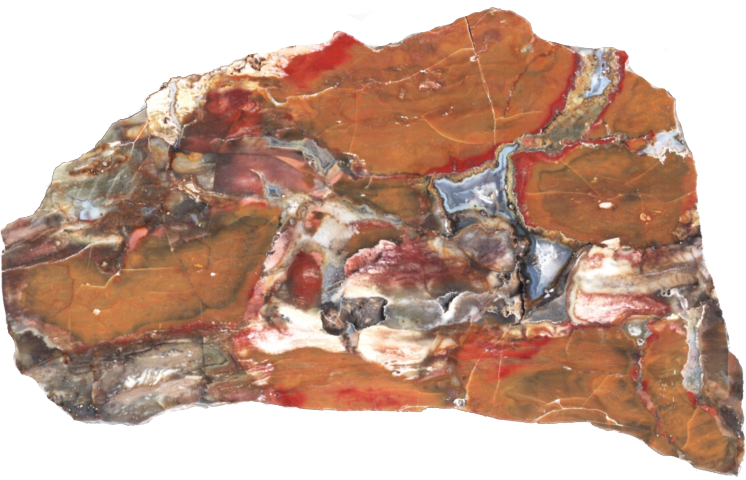 Slab 08 Petrified Wood 2 1/2" piece, I think this is from Arizona. 1 Cent WITH $25 PURCHASE. Please order only one 1 cent piece per order. Slab 09 Petrified mud, McDermitt OR 4 1/2" piece, this really is mud. 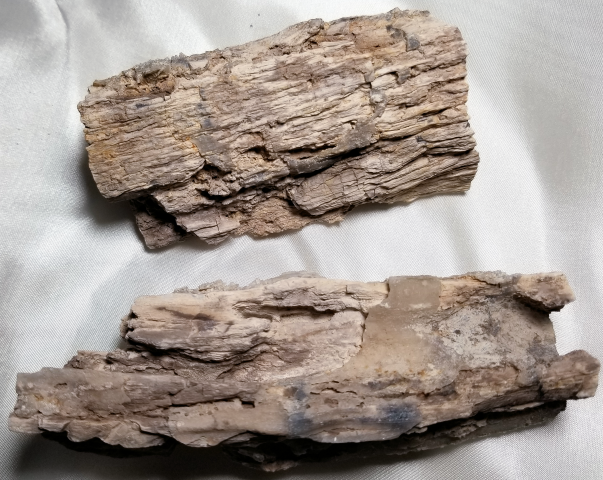 Perfectly flat layers that look like petrifieid wood but definitely is not. Slab 10 Burnt Ranch jasper, OR 3" piece, I might be the only person selling any of this. Brown! 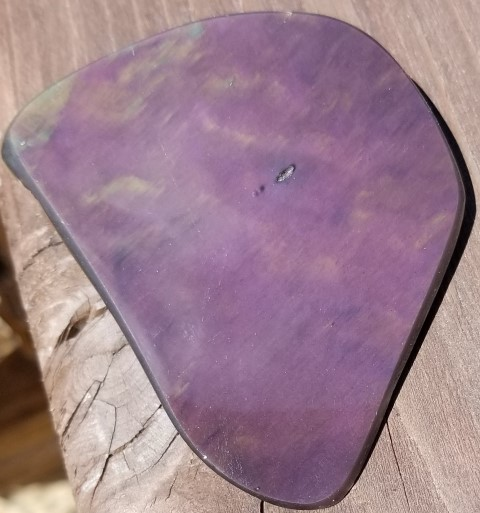 Slab 11 Lily Pad jasper, OR 3 1/2" piece, not to be confused with Lily Pad Too :) 1 Cent WITH $25 PURCHASE. Please order only one 1 cent piece per order. 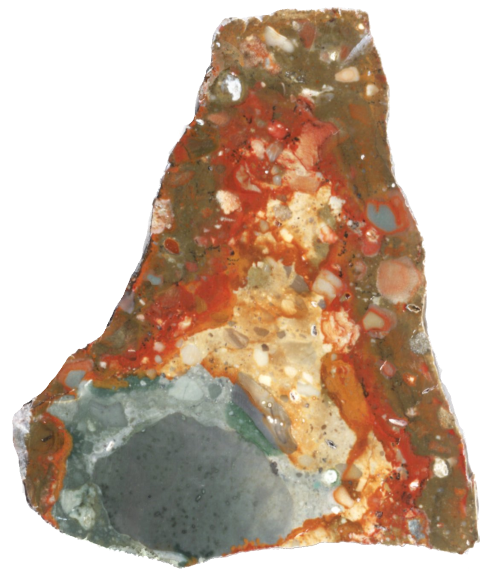 Slab 12 Autumn Hope jasper, OR 4" piece, beautiful example of this new jasper..
Slab 13 Sheep Creek jasp-agate OR 5" chunk, I've never seen this crazy pattern in this material before. Stands up straight so no need for a display stand. 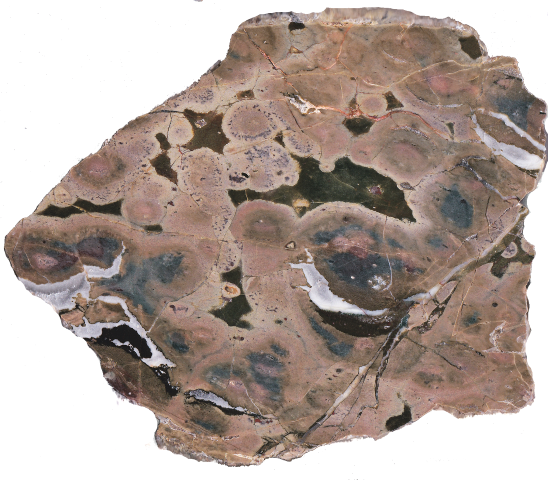 Slab 14 Stromatolite 4 1/4" Fossil stromatolite, basically petrified stacks of marine blue-green algae. Yum. 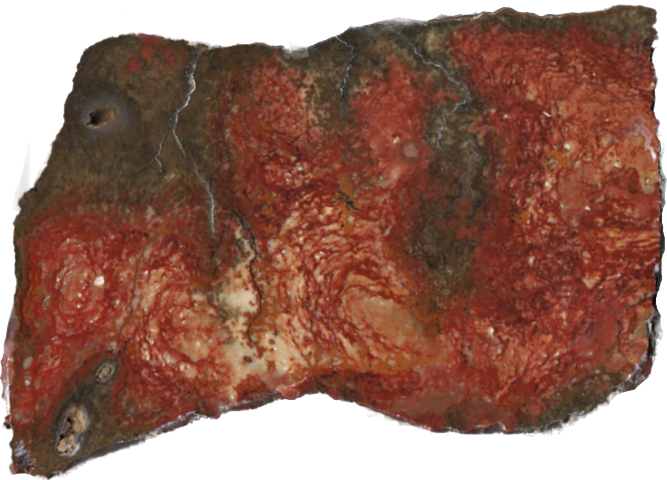 Slab 15 Arizona Petrified Forest wood 3 3/4", piece, nice bright red jasper. 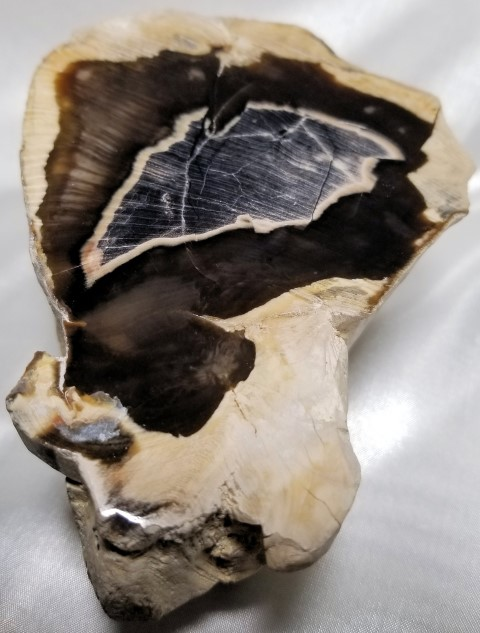 Slab 16 Bear Creek petrified wood OR 2 3/4" piece, typical black and tan colors. 1 Cent WITH $25 PURCHASE. Please order only one 1 cent piece per order. 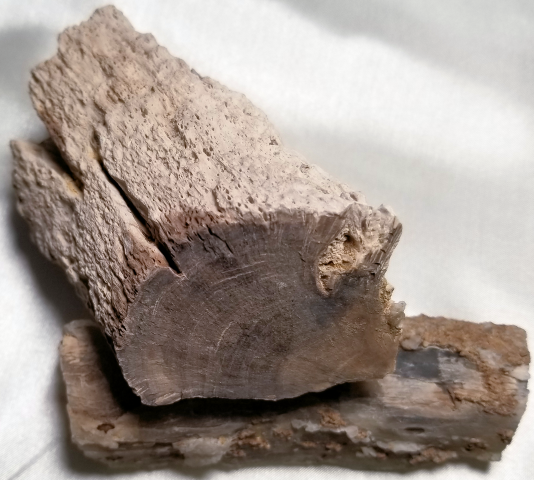 Slab 17 McDonald Ranch petrified wood, Ashwood OR 2 3/4" piece, rare stuff. 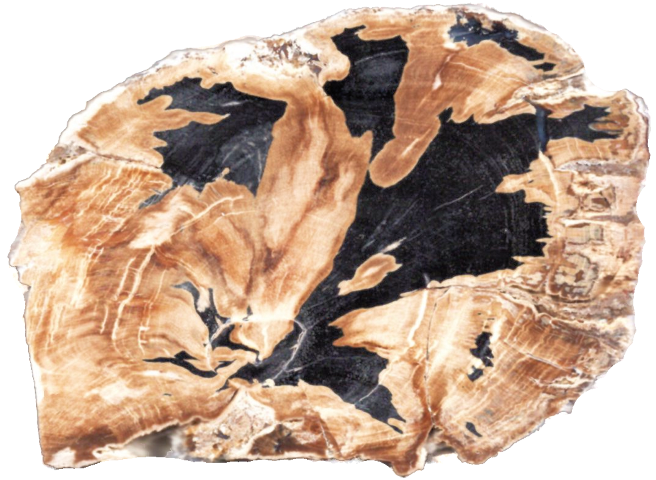 Slab 18 McDonald Ranch petrified wood, Ashwood OR 5" piece, Metasequoia tree wood. 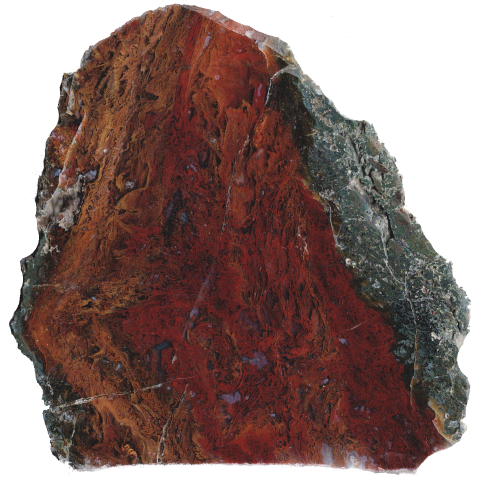 Slab 19 Cripple Creek jasper, OR 5 1/4" piece, about as good a scene as it gets. Looks MUCH better than the photo!. 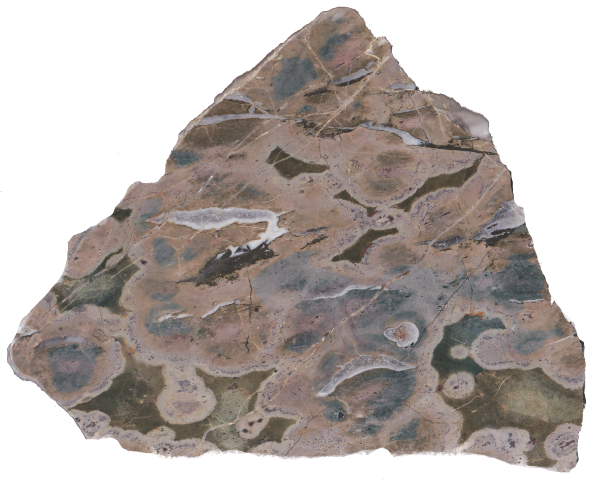 Slab 20 Stromatolite fossil, WY 4 1/4" Fossil stromatolite, basically petrified stacks of marine blue-green algae. Yum. Type the email address above into your email program. The last character is the number one, not an I. Please note: My email address has changed as of Jan 2010 to evade the spammers. The old email address was inactivated soon thereafter so don't use it anymore as I will NOT get your email!